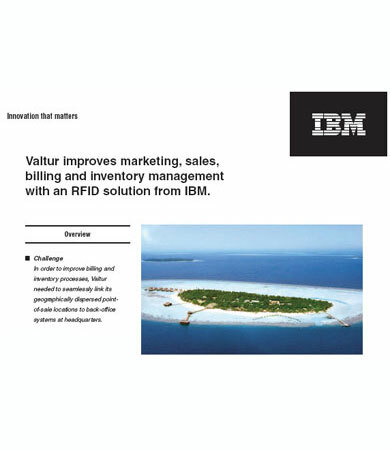 Valtur improves marketing, sales, billing and inventory management with an RFID solution from IBM. IBM Global Services-Global Technology Services apply best practices Valtur’s Quick Pay “shop everywhere” solution–deployed in 1998 by IBM and WSC –is an onsite wireless network activated by a smart card, or badge, embedded with RFID technology. Data transmission to Valtur’s headquarters is via satellite. “With employees at all 20 locations manually counting all the cash, the different colored tickets and necklaces, it was an dministrative bottleneck. We needed to make a count at each point of sale every night, and bill these back to each individual room. Now, with our Quick Pay RFID solution, this is all automated, and the billing system is transparent to our customers, with itemized purchases,” explains Tarulli. The information exchange is immediate for this first-of-its-kind solution, and linked into back-office processes. RFID-enabled badges issued to guests upon arrival are used as debit/credit cards that may be paid in advance or upon checkout. The badges allow Valtur customers to make purchases quickly and easily from strategically located kiosks that offer food, beverages, clothing and souvenirs. Instead of limiting sales to resort shops and restaurants, the RFID badges make it convenient for customers to order goods and services on the beach, in a spa, in a specialty boutique –or anywhere within its resorts.